The Nerdy Side of Life: "...and the Trophy for Best Achievement Goes to..."
"...and the Trophy for Best Achievement Goes to..."
I have a question in regard to trophies and achievements, as if you couldn’t already tell by my ever so clever title. I’ve been playing video games for a long, long time...back when the controller of choice was a joystick with a giant red button on it. I played games to beat them and when I did they went on the shelf and began their journey towards becoming a permanent fixture collecting dust and roting away, with little to no hope at all of ever being played again. 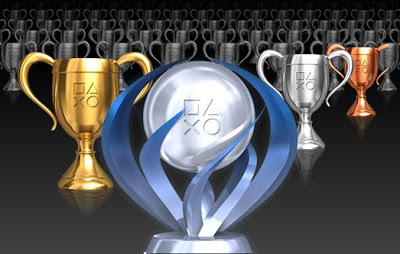 Then came the idea to award players with trophies and achievements for accomplishing special tasks during the game, which honestly at first I thought was kind of crazy and a waste of time. I believed this feature would have no impact on how I play, so I went on with business as usual only playing to get through the game and nothing more. The first time a message popped up informing me that I was awarded a trophy for accomplishing a preset task I was amused, but still thought oh well. Then came the second, the third and so on, and now I actually find myself trying to earn as many of these freaking things as I can. I can’t even hold them, can’t display them and most non-gamers think I’m crazy when I speak of them, but for some strange reason I feel as if I really won something. I even try to compete against the people on my friends list, like as if were in a race of some kind and whoever had the most trophies/achievements was winning...the most popular kid in cyberspace. Of course I’m in last place on both the PS3 and the Xbox but I’m actually OK with that. Not because I enjoy being a loser or the low man on the totem pole, but mainly because these virtual awards actually give me another reason to replay and/or actually beat the games I buy. Which I am very thankful for, especially when it’s a game I really enjoy. I was just wondering what the general consensus was, what my fellow gamers thought of these things? Thank you Steve...I appreciate the support and feedback. I will check out your blog and also follow you.